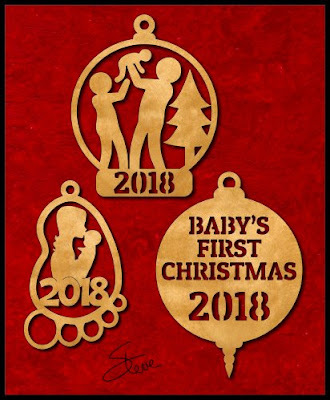 Baby's First Christmas Ornaments Free Scroll Saw Patterns. Three "Baby's first Christmas" ornament patterns. I would love to have a Tesla Model S automobile. $75,000 is a little out of my budget. Okay, it's a lot out of my budget. Luckily my Ford pickup truck will take me to the grocery store just like that Tesla will. I may not look as cool but I will still come home with groceries. Most of us started out with the less expensive scroll saws. When I was just getting started I had no idea I would enjoy the hobby as much as I do. I could not justify spending $1,000 on a saw. My first scroll saw was a Craftsman from Sears. I think it was $120. That was thirty plus years ago. Since that Craftsman saw I have owned several scroll saws. Each one has given me hours of fun. Yes, even that Craftsman allowed me to enjoy the hobby. I made many projects on that machine. 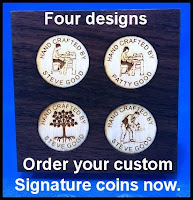 I eventually gave it to another woodworker. Believe it or not, he is still using it. I'm also not saying you should buy the least expensive scroll saw you can find. One scroll saw that I receive several emails about is the saw sold at Harbor Freight. The saw runs around $90. I know people who own and enjoy this machine. I still would not recommend that you buy this machine simply because it does not accept plain end blades. To be honest the quality is just not good enough to be a wise buy. I mentioned plain end blades. There are a few features that you should try to buy. You want a machine that will accept plain end blades. Pin end blades are for very basic cuts. Some entry-level saw can be upgraded to accept plain end blade using aftermarket kits. I'm not a big fan of these kits but they are better than using pin end blades. You want to buy a saw that does not try to vibrate off the table. We make delicate cuts using our scroll saws. You will not be able to make these cuts accurately if the machine is trying to run away and hide. You want to have an air blower to blow the dust off the pattern line. Yes, you can blow it away yourself but it's not worth the effort. Get a machine with an air blower. Luckily, most of the newer machines come with a blower. There are a few features that you want to have but may not be as important as those above. Variable speed is nice to have but not an absolute must have. There are not many saws today that are not variable speed. Tilting table. 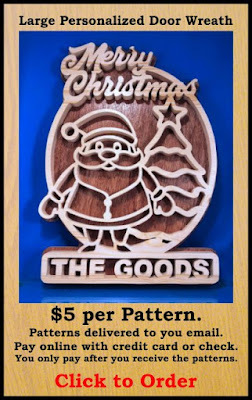 Nice to have but most scroll saw projects do not require you to tilt the table. You need light to see the pattern line. If the saw comes with a decent light that is a plus. You need to set the saw on something. If the saw comes with a stand that may be a positive depending on where you will put the machine. A foot switch is a must for me personally but not a requirement to get started. Up front, controls are very nice to have. If you have to reach the back of the saw every time you need to remove the blade that can be a real bummer after an hour of cutting. It's nice to have a quick release for the blade. You want to be able to tension the blade easily. One feature that you will not get on an entry-level machine is an easy blade change process. All of the sub $200 machines are difficult to clamp the blade in the chucks. You may get better at it after a period of time but once you use a machine that is actually easy to change blades you will understand how important this is. If you get all the features I just rattled off you won't be buying an entry level scroll saw. They just don't exist. 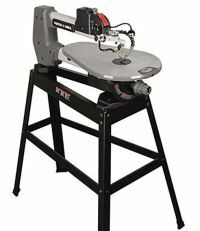 I will go out on a limb and tell you my suggestions for which entry-level scroll saws to consider buying. These are just my suggestions. If you buy one of these machines you need to do your own research. These are entry level machines and their quality of workmanship can vary from machine to machine. Buy them from a place that offers an easy return policy. If you need to stay in the $100 range I will reluctantly make a suggestion. The Wen 3920 sells for around $85 dollars. It has a light and air blower. It is variable speed. It does not accept plain end blades. I do not know if there is an after-market kit to convert it. It does not have up front controls. I briefly tested one of these machines and the vibration was decent. 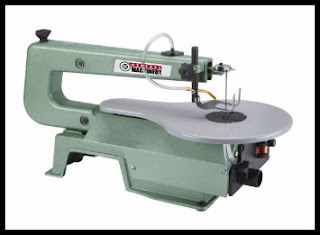 If you are in the $150 range then the Craftsman 21602 16" saw is a choice to consider. This saw is getting difficult to find. I don't think Sears still sells it. The link goes to Amazon where you can still buy it. This machine will accept plain end blades. It is variable speed and has an air blower. It does not have a light or upfront controls. You have to use a tool to change the blades. The blades are a bit of a pain to replace but it gets easier with practice. The vibration was not bad at all on the one I had in my shop for review. 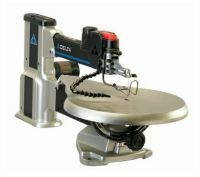 In the $200 range is the saw that Scroll Saw Woodworking and Crafts Magazine rated as the best entry level machine. I agree with their opinion. The Porter Cable 18" scroll saw is starting to get you to a feature set that would make it a mid-level saw. Up front controls, accepts plain end blades, light, air blower. variable speed, tilting table, and stand are all standard features on this machine. I reviewed this scroll saw in my shop and found it usable. Changing blades was not as easy as I would have liked but the machine is capable of fine fretwork. I'm going to throw in one more saw into this entry-level discussion. The Delta 40-694 sells for $399 on Amazon. It will drop to $350 from time to time. 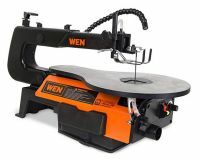 This scroll saw is my recommendation for anyone who wants to get started in the hobby and has a few extra dollars in their budget. This machine does not come with a light or stand for this price. It does have plain end blade, air blower. tilting table, upfront controls, and low vibration. This machine has one other thing that the other saws in this list do not have. Changing blades is a pleasure. Actually, it has another feature that the others do not have. The build quality is much better than the others. If you have a friend or family member who wants to get started in the hobby and their budget is limited these suggestions might be useful. Opinions about these machines will vary. I understand that some of you will have had poor experiences with some of these machines. I am basing my opinion on personal use and hundreds of letters from my readers. I am in a unique position to hear from thousands of people in the hobby. I think that experience gives me a perspective that most people are not lucky enough to have. I am just sharing that experience and not trying to get into a debate about the pro and cons of these machines. 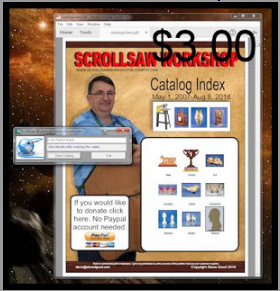 I am getting ready to update the $3 PDF catalog in the next few days. 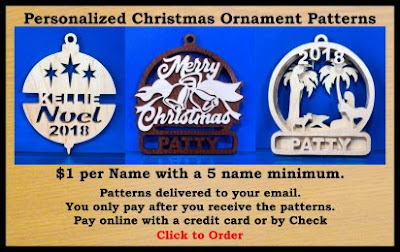 I currently have 57 new patterns to add to the catalog. I just wanted to let everyone who has purchased the catalog know I am working on the next update. Thanks for your patience.